I think I'm just about done with my catch-up activities in terms of the different DC Universe Animated Original Movies. And as I've been jumping back and forth across their direct-to-video library, the end result has me thinking that the older movies felt a lot better than some of their more recent endeavors. Maybe this is just a matter of opinion, but they don't quite seem to hit that mark of "great" that I used to feel after watching them. They're not totally bad just yet, but they're not getting that far past "good" either. Son of Batman was another of the DC movies that were closely tied to a comic book storyline. And while you can sort of say this about many of the movies, the way that they structure things sort of determines how important that particular comic book story is with respect to the movie. And while some liberties with the story are sort of expected, deviating a bit too far can somewhat ruin things as well. Combine a somewhat odd story with different voice actors than the ones we're used to and other quirks like that and the end result is an okay but somewhat lackluster movie experience. I kinda miss Bruce Timm being more active with all DC animated productions. 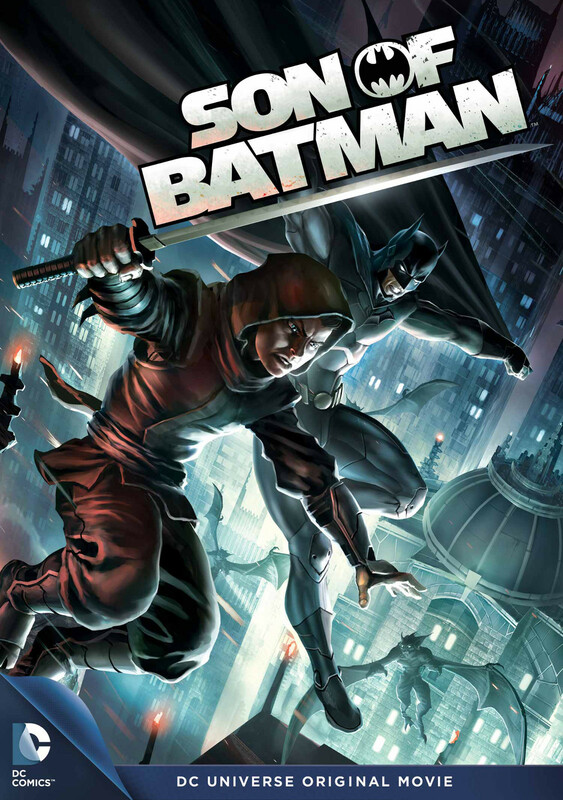 Synopsis: Son of Batman is a direct-to-video animated superhero movie directed by Ethan Spaulding. The screenplay by Joe R. Lansdale is rougly based on the Grant Morrison and Andy Kubert Batman and Son storyline. The movie begins in the headquarters of Ra's al Ghul's (Giancarlo Esposito) League of Assassins. There he is overseeing the training of Damian Wayne (Stuart Allen), who is the son of his daughter Talia (Morena Baccarin) and Batman (Jason O'Mara). But then they are attacked by Slade Wilson (Thomas Gibson), who was supposedly the first choice to take over the League of Assassins. Ra's is apparently killed before he can get to the Lazarus Pit while Slade gets away. Talia then takes Damian to Gotham City to better protect him. The biggest change in this movie versus the comics was the decision to bring in Deathstroke as the big villain. This wasn't the case in the comics and the story had to be reshaped to accommodate his participation in things while relegating Talia, the antagonist in the comics, to yet another damsel in distress that needed to be rescued by Batman in the end. I don't see why this was at all necessary and the whole angle about Deathstroke being the supposed successor of Ra's al Ghul felt very left field. Another key difference was the fact that Tim Drake, who was Robin in the comics, was completely removed from this story. And while you could argue that it wasn't necessary for him tobe in this story, if anything I think he provided a wonderful contrast against Damian. Without him, we just have Damian trying to be an underage badass, which at times was a little annoying. So we had a lot of Slade Wilson trying to be your sort of classic villain with Batman barely keeping Damian in check. They had some fun fight sequences for sure, as is generally consistent across the DC movies, but on the whole it just felt odd. The story felt very tropey and not at all as strong as the original work. Even if I hadn't known of the original comic book storyline, I'm pretty sure that I still would have been disappointed with how things turned out. Voice acting as a little hit or miss as well. In a post-Conroy universe, I know it's a challenge for anyone to be a great Batman. But I'm not quite sure if Jason O'Mara quite has what is needed for the role. My only delight was probably Morena Baccarin as Talia, although I have to admit her role as a Companion on Firefly wasn't too far away from the personality of Talia in this movie. Or maybe that's just me. Son of Batman was yet another just okay DC movie, bordering on being bad though. And maybe I'm judging this movie a bit too harshly, but I still hold that the story that they assembled here seemed far too shallow for one that involved the likes of Ra's al Ghul and Talia. Thus the movie only gets 2.5 odd moments of Deathstroke commanding his assassins out of a possible 5.